LilSparky's Workshop adds auction-derived pricing information for trade skills right into the trade skill recipe frame. Each skill is evaluated for material costs and potential value of the item created. These two numbers are listed next to each skill in an easy-to-read format. Auction pricing models can be selected by right-clicking either the value column or the cost column (each can have a different pricing method attached). The Value column can be left clicked to cycle through the different valuation methods for the resultant item: Auction Value (a), Vendor Value (v), Disenchant Value (d) or the greatest of the three different values (the default). Any instance of an item Value being greater than the Cost to create it will have a highlighted Value entry. Optionally, the Value column can be displayed as a percentage of the Cost column. The Cost column simply sums up the costs for each reagent and reports the total. Both columns can be combined into a single "Profit" column which simply reflects the Value minus the Cost. Tooltips for each column give more details about the price breakdowns LSW is considering. The item# is the item ID for the specific item. It is a single number. For example, 2589 is Linen Cloth. Setting the value to "true" means the item is available at the vendor. Setting the value to "false" means the item is not available at the vendor. Setting the value to "nil" means to use the provided databse. There is now also a right-click option to override the vendor availability and also to hand enter specific prices for items. LSW utilizes a plug in scheme to handle support to handle pricing and frame support. I am unlikely to add additional plugins directly into LSW. The goal of the plugin system is to provide basic templates that other addon authors could employ to provide LSW support on their end while at the same time providing functionality for a base set of common mods. Addon authors are free to contact me regarding the plugin system if issues arise or the system doens't make sense. I opened a ticket about it, it's definitely reporting invalid values. 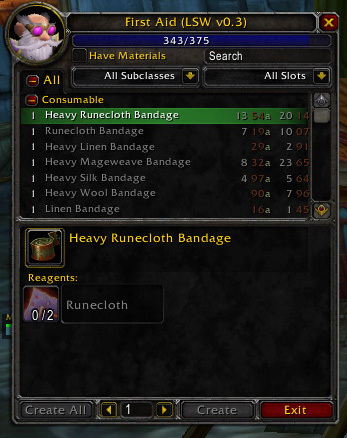 if it's just for enchanting, i think it may be an api bug i've seen reported regarding the # of items crafted (enchants apparently return a random value now). i don't think i've seen anything peculiar on the ptr, so it could be fixed now and waiting for an update. i'll double-check. The values that lilsparky's workshop reports for crafting items is totally bogus in 5.4. It will tell me things like 875g for an enchant, but auctioneer reports it as 3g for the enchant. The auctioneer value matches up with what is in the AH. I have taken over maintenance of KevTool Queue, an addon which allows you to automatically queue items up for crafting in GnomeWorks or Skillet with a simple command. I have found the combination of GW, LilSparky's Workshop, and KTQ to be extremely powerful. It saves me an enormous amount of time on my daily crafting chores. Or search for KevTool Queue in the Curse client. There are issues with 5.3, ticket entered. Hopefully, you can get added as an author to this addon as well so we can get a your patch(es) into SVN. What line did you change? Blatantly stole this from Skillet. Change one line in UpdateRecipeCache() to point to the new function. Fixes bug where those enchants would not be able to be used for log of pricing and sales. Keep the good work up! Love your addon soo much! I'm assuming from the dates of recent files that this version is for 5.0.4 or 5.0.5. Any chance of getting that updated? Edit: After downloading and installing r136, I see that the .toc has not been updated.